"This selection is from a large series of one hundred prints illustrating the well-known poetry anthology, the Hyakunin isshu (One hundred poems for one hundred poets), which was compiled in 1235 by the celebrated poet Fujiwara Teika (1162-1241). Although some view the anthology as a casual collection of poets and poems, most regard it as a careful selection of poetic styles and schools that was designed to educate students of poetry. The Hyakunin isshu has always been a popular subject and has appeared in different aspects of Japanese culture: it has even taken the form of a card game. After Tsunenobu recites this poem about the autumn breeze, a frightening ghost appears and responds to his poem with one by the Chinese poet known in Japan as Hakuraten. Kuniyoshi's print illustrates the poet working in his study at night whilst an enormous hirsute ghost recites a poem outside his window. [Although this print in the Lyon Collection is trimmed, it is noted that] Each print in this series is numbered in the margin and today 58 of the 100 have been documented. This print is incorrectly numbered 72; it should read 71. Like many other sheets in this series, different versions of this particular print exist. 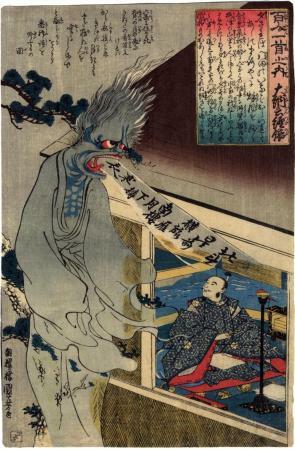 One depicts a darkly coloured ghost with a white text on a darker background emanating from its mouth and bokashi (graded colour printing) at the top. A second edition shows a lightly coloured ghost with a white text against a dark ground... and a third edition has a lightly coloured ghost with a contrasting text. The chronological order of these three editions has yet to be fully established." Quoted from: Heroes and Ghosts: Japanese Prints by Kuniyoshi 1797-1861 by Robert Schaap, p. 59 with a color reproduction.